On February 15, 1898, the Battleship Maine, while cruising Havana harbor in Cuba, suddenly exploded and quickly sank with a huge loss of life. The 'yellow press' of Hearst and Pulitzer immediately blamed Spain and the phrase "Remember the Maine, to Hell with Spain" became a household phrase. 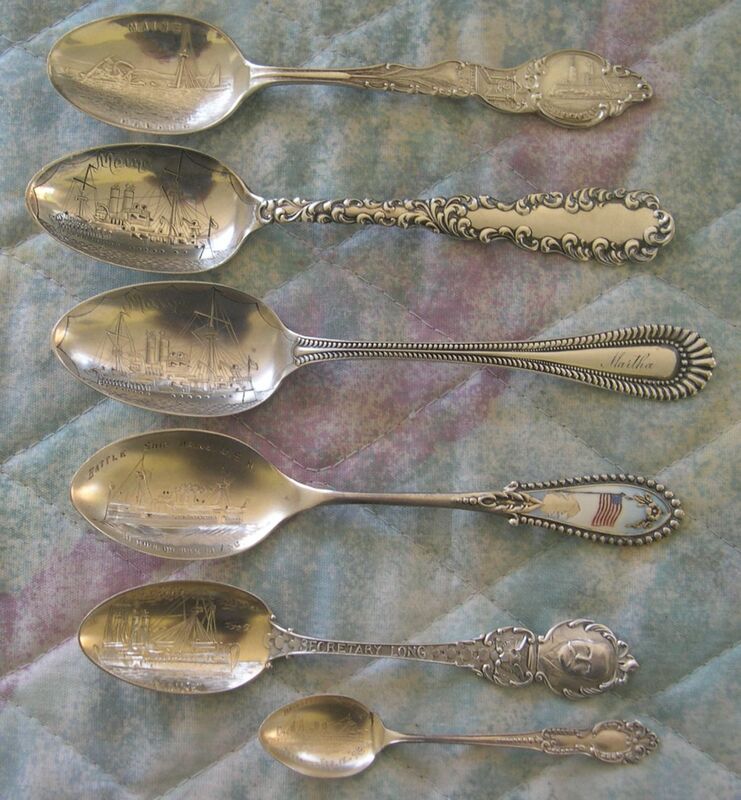 Even today, the cause of the sinking of the Maine remains an unanswered question and an investigation at the time did not produce an answer. The 'yellow press' accused Spain of sinking the ship, but there was also a possibility of the boiler exploding and/ or a fire. Spain denied involvement and Pullitzer privately agreed that Spain was not involved (but his newspapers continued to lobby for war). 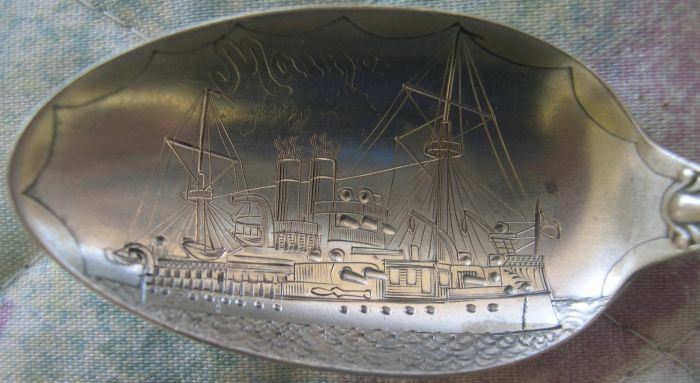 The Maine was originally an armored cruiser which was built in response to the Brazilian battleship, Riachuelo (Brazil had the largest military fleet in the western hemisphere) and new battleship technology invented in Europe. However, due to protracted construction delays, by the time she entered service she and her sister ship, Texas, were aleady considered to be obsolete. The loss of this battleship was one of the leading causes of our entry into war against Spain. 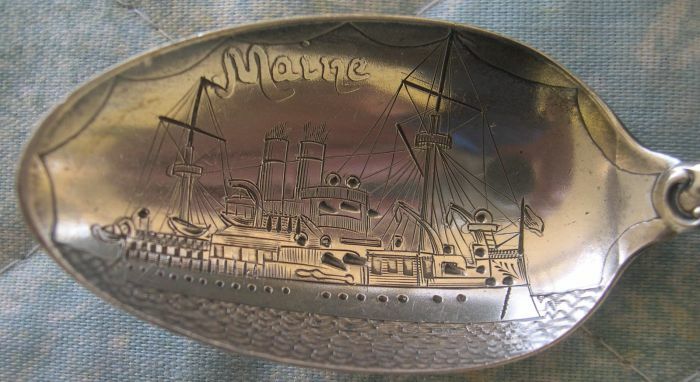 There are a great many different spoons depicting the Battleship Maine and they range from cheap silver plated pieces to very expensive custom spoons. 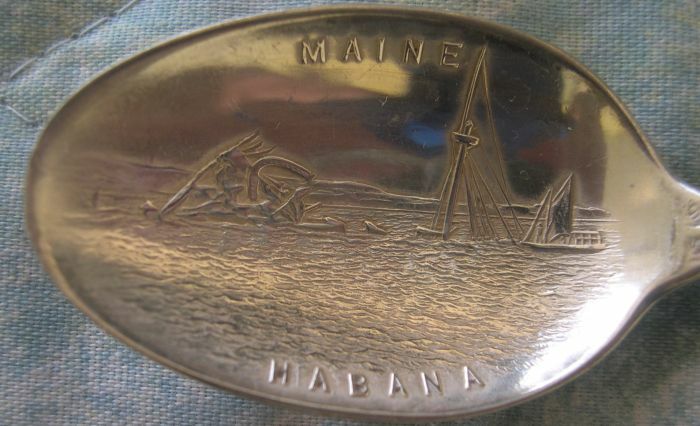 Embossed view of the sinking of the Maine in Havana harbor.